What a spectacular date the 11th of February, 2011 was. That is the date format used in Egypt and most other countries. 11022011 is a numerical palindrome — a series of numbers that can be read the same way in either direction. This is a rare occurrence in the calendar, and what happened in Egypt on that date was rare and spectacular too. When calculated one number at a time, this sequence adds up to 8, the number of POWER ON THE MATERIAL PLANE. We witnessed real power on that date. A different kind of power! The power of the HUMAN WILL! The fact that such a major event occurred on this date suggests that the balance of power, which the world so badly needs, is shifting drastically now. This will undoubtedly bring new dangers into the world, but also many instances of inspiration and breakthrough. Humanity has taken a turn toward freedom. 2011 is the last year for quite some time in which the number 11 dominates, and its presence is likely to be more dynamic than ever this year. Look at the position of the two 11s in that date. This is 11:11 energy expressing itself in a more complex way than we are accustomed to. 11+11=22, the ‘master’ number which facilitates large-scale accomplishments which can IMPROVE CONDITIONS FOR THE MASSES. Add the 22 in the center, and you have the ‘master’ number 44. 44 = 8. It is still the number of power on the material plane, but when 8 is derived from two 4s, it can help us develop remarkable abilities of concentration and determination which can be used to accomplish anything that is worthwhile and ‘needed’ for the betterment of life. 44 also signifies THE MEETING OF OPPOSITES, which can either clash and make life unbearable for each other, or they can find common ground, ‘live and let live’, and work toward peace and sustainability. The fact that 44 is involved cannot help but bring President Obama into the equation in a highly significant way since he holds the 44th presidency of the United States. Of course, he is already highly significant without this, so it will be very interesting to see how his presence affects us all in the days and months ahead. 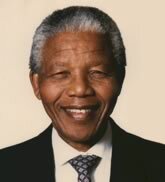 The 11th of February was also the date on which Nelson Mandela was released from prison in 1990. His famous prison number 46664 is also a palindrome, with two 4s at either end (the number of both confinement and breakthrough), and the so-called ‘number of the beast, 666’, in the center which, to me, reflects the brutal apartheid system of South Africa which imprisoned him for 27 years, and which he eventually brought down. He became the president of South Africa. 46664 adds up to 8. So does his date of birth, the 18th of July, 1918. He is 92. He is frail. He was hospitalized briefly in January, and I felt the stirrings of grief knowing that he’ll be leaving us soon. He is deeply loved all over the world. Nelson Mandela personifies LOVE — the greatest power of all. That’s why people so often cry when they meet him. POWER is in the air this year. All kinds of power. The events of 11022011 focused on NORTH AFRICA and impacted the world. 46664 came out of SOUTH AFRICA and impacted the world. It could be that the entire continent of Africa is rising here, not just that area we call The Middle East. I have long believed that Africa will heal and reinvent herself as the shift to equality takes shape … but I think I’m getting ahead of myself now. There is a long way to go and, as other governments come under the same kind of pressure as Egypt, it could all turn very ugly for a while. We need to be prepared for that, and I don’t think anyone can assume that this energy shift won’t affect their particular part of the world. Our planet has suddenly become a very small place. Last year demonstrated the power of words, and the word PALINDROME is very interesting indeed. It is derived from the Greek “Palin” meaning AGAIN, and “Dromos”, meaning WAY or DIRECTION. It occurs to me that numerical palindromes indicate the fact that all situations can go either way, backwards or forwards, depending on the choices made. How fascinating that the word PALIN crops up here and that its meaning is ‘again’, ‘yet again’, ‘over again’ or ‘repeat’. Hmm! Backward or forward? The numbers 2 0 1 1 have brought us into a 4 global year. (2+0+1+1=4). Just as last year’s 3 global year was symbolized by the triangle, 4 is symbolized by the square. 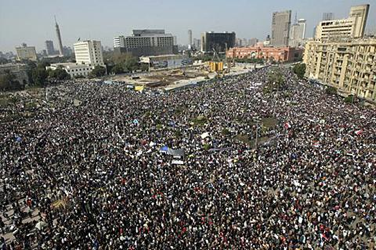 And sure enough, on January 25, the eyes of the world became focused on a square in Cairo — Tahrir Square. The whole world watched as the people of Egypt summoned the COURAGE to free themselves from the unbearable weight of oppression. We watched them take back their stolen WILL. Intense focus continued for 18 days. The 4 energy encourages us to focus, to take things seriously and look more closely at the details and implications. This was not destined to be just another sad, disorganized, frantic, bloody and ill-fated attempt to break free. This was different. The glow of SINCERITY emitted by the Egyptian people on the streets was hard to take one’s eyes off. Sincerity cannot be faked. Sincerity is energy shaped by what we genuinely believe to be true. Sincerity is the basis of COURAGE. Combine that with CLARITY OF PURPOSE, and DETERMINATION, and you can reverse the status quo. Courage comes from THE HEART (Couer is the French word for heart.) The Heart is the 4th Chakra which is going to play a pivotal role in what happens this year. The human heart really does have to heal now because it is torn and broken in many places, and that is what is causing so much heartlessness on Earth. What happened in Egypt is a reflection of the turmoil going on within each of us, a deep yearning to be free, no matter where in the world we live. It is also a reflection of our potential to heal the damage done and create something better. This bonding of hearts enabled the world to SEE and FEEL the power of peace manifesting out of peaceful INTENT. This bonding of individual Egyptians with each other came from the power of SELF-ACCEPTANCE — without which we cannot take full responsibility for our own lives and evolve. Self-acceptance is currently our greatest stumbling block and needs to be our greatest GOAL at the present time. We cannot evolve further until we allow this part of our nature to surface. Why? Because SELF-ACCEPTANCE is peace within — the only thing that can bring peace to the outer world. The 18th day of the uprising brought an end to their first step — which was to free themselves of their immediate oppressors. 18 adds up to 9, the number of endings, so the timing was perfect. What a huge goal they set for themselves! We have to have a goal in the 4 energy if we are to make any headway, so we should all aim toward something significant, worthwhile and relevant to our true needs. This event can teach us so much about setting a goal and applying the necessary DEDICATION, EFFORT, ATTENTION TO DETAIL, ORGANIZATION and STAYING POWER to see it through. All of those things belong in the realms of the 4 energy and all are necessary to our progress this year. 4 emphasizes matters of: LIMITATION . RESTRICTION . STABILITY . DELAY . OPPOSITION . INEXPERIENCE . ORDER . SYSTEM . DETAIL . ORGANIZATION . ROOTS . FOUNDATION . STRATEGY . IDENTITY . STRENGTH . DIFFICULTY . PRECISION . CRAFTSMANSHIP . PURPOSE . CONSTRUCTION . WORK . HOW THINGS WORK . SCIENCE . TECHNOLOGY . ECONOMY . EFFICIENCY . PRACTICALITY . DETERMINATION . THE SQUARE . THE BOX . THE HEART . THE 4th CHAKRA . THE 4th DIMENSION . THE COLOR GREEN . COURAGE . STRUGGLE . ORDER IN CHAOS . BREAKTHROUGH . THE SELF is represented by the number 1. 4 is the number of IDENTITY. One of the biggest factors of 2011 is likely to be SELF-IDENTITY. Who are you? Why are you here? What do you want? And we had better learn to answer those questions on a deep inner level, otherwise the reflection we get is more likely to involve identity theft, identity cards, and other forms of constantly having to prove ourselves. PATIENCE, EQUALITY, PULLING TOGETHER and PEACE are the lessons of the feminine 2. This is the principle energy of the new millennium, and is so different from the masculine 1 energy that has limited us to an imbalanced, aggressive ‘man’s world’ rather than a balanced world. 2 is the sensitive vibration most associated with Mother Earth, and 4 brings us down to earth! So, our physical WORLD — our beautiful but totally abused planet — needs much of our attention. She will also be healing and freeing herself this year. Competition has become so fierce that WAR is always its potential next step. The power of 2 shows us that the only way forward from here is through COOPERATION, not contest. Whether it is 3,000 lives lost in New York, 100,000 in Nagasaki and Hiroshima, MILLIONS of Jews, gypsies, gays, civilians and military in World War II, or any instance where lives are snuffed out in the name of greed, conflicting interests or ideology, killing each other is ripping the very fabric of humanity apart, leaving gaping holes where life used to be. How can anyone argue about the sanctity of life, and then proceed down the path of war as if it is something righteous, justifiable and inevitable? War is madness. Mindlessness. War is the ultimate act of terrorism. The so-called ‘war on terror’ is war on war — that is to say, war on top of war, on top of war, on top of war. The ‘War on terror’ is therefore NEVER-ENDING war. Terror is a legitimate emotion in the great range of emotions. It is fear in its most extreme, condensed and unmoving form. The emotion of terror needs to be soothed and reassured. It needs to be healed and allowed to return to love — which is where ALL feelings come from. Our emotions, whatever form they take, are love’s response to experience. Love can never hurt us, but love does GET hurt, constantly and unnecessarily. The number 3 is hugely symbolic here through its focus on COMMUNICATION, APPEARANCES, OPTIMISM, SOCIAL CONNECTION, FRIENDLINESS and JOY, as well as those ancient triangular symbols that Egypt is so famous for -- PYRAMIDS -- 3-sided structures with a square for a base. The importance of 3 cannot be underestimated, because its triangular self-replicating energy is enabling aspects of this transformation to SPREAD throughout the region and the world. Egypt has set an example.It is lack of self acceptance that enables others to steal our Will in the first place. Lack of self acceptance means that we are not vibrating at our full capacity. We are holding back. We are not whole. We cannot be at peace with others if we are not at peace with ourselves.The 18th day of this amazing uprising was most significant for reasons other than its intriguing palindrome. 1+8=9, the number of deep emotions, honest expression, giving, endings, global reach and healing. Also, 1 = the individual. 8 = power. The power of the people rose before our eyes. Through unity of purpose and undaunted determination, a piece of the HUMAN WILL found a strength it had never known before and came to life in that square in the course of 18 tense days, while the eyes of the world looked on through the marvels of modern technology.This view of reality made us deeply aware that people are not as divided as the controlling few would have us believe. Finally, the alarm, the fear and the hopelessness had been put in their proper place -- where they can no longer cause harm. I'm not talking about the alarm, fear and hopelessness that these individuals expressed. On the contrary, emotional honesty is what gave them their strength. What they put in its right place was the alarm, fear and hopelessness that had been IMPOSED on them by an oppressive regime.Most importantly, they released themselves from the guilt that ALL controlling elements place on people because guilt makes self-acceptance impossible. In order to keep control, the 'voice of authority' uses guilt disguised as love to invoke FEAR. That is why Mubarak, in his final speech, on 10 February, condescendingly addressed the people as his 'children' and he their 'father'. His patronization did not work!The people's acceptance of themselves increased the power of their presence, which filled up the space within them that guilt had occupied. We must all learn the difference between love and guilt so that love can prevail. Love loves. Guilt judges. Love and guilt cannot coexist, because guilt contains no love or even a desire to love. Our difficulty is that the differences between love and guilt can be very subtle. However, love does not want anyone to suffer. Guilt does not care or even notice if anyone suffers. Unconditional Love is the highest power of all, but it can only be unconditional if you fully accept yourself, including your true feelings, regardless of what guilt has to say about them.The people of Egypt gave us a spectacular show of strength on the world stage; a kaleidoscope of emotional expression, an example of what can be achieved by refusing to go on in the same old self-defeating manner, refusing to be ruled by guilt and fear, and pulling together for the common good. 4 is the number of PURPOSE, DETERMINATION and STRENGTH. And they did all this, not through the usual violent and bloody uprising but through peaceful intent. Loving intent.Now, of course, Egypt and the rest of the world must deal intelligently with the uncertainty that this shift in reality has brought about, and the likelihood that the feelings involved will spread around the region and the world. No matter where we live on this planet, our free will is blatantly and constantly violated. These are very early days and, as the situation plays itself out, it will have its inevitable problems. Our journey into openness and free will has taken a hopeful turn -- which reminds us that hope is always the last thing to go. Therefore, never let go of hope!The quest for certainty blocks the search for meaning. Uncertainty is the very condition which impels people to unfold their powers.-- Erich FrommThere will be many setbacks in this 4 year. That's the nature of 4. It brings us out of denial so that we can deal with our problems and the UNCERTAINTY head on. Of course, wherever there is uncertainty, there is fear. It's time for us to face our fears instead of blocking them out, denying them, pretending there is nothing to fear, or shooting the messenger by accusing fear, or other emotions, of being the cause. This year's uncertainty can either destabilize us further, or it can do what the above quotation suggests: unfold our powers to create something new and better. 4 shows us precisely where and why we are NOT free, and how to get through those areas in which we are stuck. The practical, no-nonsense and down-to-Earth energy of 2011 will unearth vital DETAILS, some of which have been concealed or ignored, and some that are simply finding their way into consciousness at exactly the right time. Our long journey out of denial and into Free Will continues. Unlike the ‘triangular’ 3 energy of 2010, which kept us on the surface and revealed the extent of our own shallowness, the ‘square’ 4 energy of 2011 takes us DEEP into reality — right down to the roots. There is often a real sense of urgency in the 4 vibration. More people than ever are feeling it and paying serious attention not only to what is happening in the world, but also to what they themselves are feeling. As a result, the question of SELF-IDENTITY is growing stronger. Who am I? Why am I here? What am I supposed to be doing? “Oppressed people cannot remain oppressed forever. — Martin Luther King Jr., Letter From Birmingham Jail. The frustration of not being able to live in a way that is natural for us, produces strong emotions which push us, from the inside, out of denial and into reality. The more we express ourselves honestly, from the heart, the more truth we want. Change is a lot easier to implement when change is what we truly desire, and truth is a lot easier to accept when truth is what we’re actually looking for. In this goal-oriented year, getting to the truth needs to be a goal, not something we merely wait for. This is a chance to ease our great ‘fear of the unknown’ and embrace it instead. How can we learn anything new or take sustainable routes into the future if we are afraid of what might possibly be out there? We stubbornly cling to our fear of the unknown so that we won’t have to make the decisions we know we need to make. We must be able to LOOK at our problems if we are to make progress because we are going to be living in a state of uncertainty for a long time to come. 4 is the number of EFFORT. It’s going to be HARD WORK this year no matter which approach we take, so we might as well resign ourselves to accept whatever occurs and deal with it in a way that has a real chance of breakthrough. ORDER, SYSTEM, ORGANIZATION, FOUNDATION and BUILDING are important factors of the 4 energy. 4 shows us that getting organized provides the order and system necessary to operate effectively. Organization provides a firm foundation on which to build. No one can predict the specifics of what lies ahead because not only are we creating the outcome as we go, it’s all happening more spontaneously than anyone is accustomed to. The more real and spontaneous we become, the more we experience life in real time. As life becomes more open, fluid and transparent, attempts to manipulate the population cannot work as effectively as they once did because the tactics involved are just SO obvious. Last year’s emphasis on the power of words, images and communication has made us so much more aware of how easily we have been fooled by words and images in the past. The future is unknown because WE, the people, are creating it with every choice we make. But history will continue to repeat itself until we find a way to let go of what we’re so desperately holding on to — the old ‘safe’ familiar ways of the past. For as long as we crave certainty, we cannot let go of the old and outdated, and remain oblivious to alternatives. We create the future through the power of our individual and collective INTENT. It all depends on knowing what we want and how far we are willing to push ourselves in that direction. Of course, those who control the old system have a vested interest in keeping people in constant conflict and fear. If we are fighting among ourselves, we are less inclined to fight with them. They live by the sentiment: “divide and conquer” and must limit our ability to feel in order to stay in control, because the more we are able to feel, the more we are able to look at reality and gain real intelligence from what we see. People must seek common ground if we are to stay strong, find our balance, and survive. When we agree on something, we are unanimous. We are one… and strong enough to recognize the irrelevance of ancient rivalries and other dividing factors. This was most apparent last Christmas when Egyptian Muslims protected Christians as they celebrated their holy day, and when Egyptian Christians protected Muslims as they held their Friday prayers during the protests in Tahrir Square. This uprising is not about religion. It is about FREEDOM. It is about PEACE. This year, we ALL need to find areas of agreement — common ground — if we are to evolve into a more peaceful and livable existence. The more we are able to accept ourselves, our individuality, the more we are able to accept others. And so, hatred toward others is denied hatred of oneself. We need to recognize that, otherwise guilt will continue to attack us for daring to feel our true feelings. The process of evolving into the feminine 2000s from the masculine 1000s is creating a massive shift in our reality on Earth. Feminine energy, which has been suppressed forever, is healing its pain by expressing it outwardly. As a result, the human Will is healing and strengthening. THE HUMAN WILL IS RISING. Of course, as the desire for peace and understanding continues to grow in our world, it will be constantly opposed by those whose only desire is to control. It’s not all peace and light we’re dealing with here. We have to be practical. We have to see things as they are and not get caught up in mere wishful thinking. In order to progress, we have to be fully aware of what we are up against, because we can be certain that much effort will be put into dragging the Will down again. We are learning that enormous change often comes at enormous cost and takes undaunted continued effort to see it through to completion. It takes dedication to purpose until the job is done. In their struggle to break free, Egyptians demonstrated what it takes to achieve real and significant change. There is much hope in this vibration because 4 provides the driving force — the push — needed to fulfill potential. However, 4 is also considered to be the cold task-master of the numeric spectrum. After all, 4 is the number of HARD WORK and hard work is what it will take to accomplish anything worthwhile this year. The human WILL is pouring through the cracks of a collapsing system of greed. January 25, 2011 was a 3 day in the world — the number of happiness, communication, social connection, networking, popularity and population. On that day, Egyptian people from all walks of life, young and old, men and women, Muslim and Christian, began a popular uprising against oppressive forces that had kept them down for over 30 years. Social media such as Twitter and Facebook were instrumental in the organization of this mammoth event, and even when the old regime switched the internet off, people still found ways to communicate by phone, ham radio, and plain old word-of-mouth. We all have different beliefs and points of view, but we share the same basic needs which include a roof over our heads, food, water, healthcare, companionship, freedom, and LOVE. People everywhere have the same desire for peace and ease, and are sick and tired of permanent war and struggle, sick and tired of being controlled; sick and tired of being afraid; sick and tired of suffering. People everywhere are willingly pulling themselves out of the darkness of denial, knowing that facing reality is the next step. We develop courage by facing our fears which, in turn, produces a greater desire for truth and realness. Since the beginning of the 2000s, we have traveled far on our journey out of denial. We have reached a point where we are trying harder than ever to be honest with ourselves, and each other. We need to start accepting the fact that we are humanity. We are diversity. As such, we will always have differences. We are interconnected individuals. When we allow that amazing thought to really sink in we can never go back to the old shallow way of life. Situations may be difficult, money may be tight, but our understanding of life has crossed a point of no return. The intense vibrations of our emotions have expanded consciousness measurably. Since 4 is symbolized by the ‘square’, the numbers involved are being ‘squared’, (multiplied by themselves) and greatly intensified. Emotional energy is symbolized by the feminine number 2, which is the square root of 4. And 4 brings us to the ‘root’ of whatever we are dealing with. Colgate University, specializing in modern Egypt. So much change is in the air now. Mubarak was hardly the only dictator that was protected by the US, Britain and other countries. From Saudi Arabia to Chad to Uzbekistan, we have been propping up some terrible and terrifying regimes. The AlterNet article at the end of this page names some of them. The relationships involved have suddenly become a lot more complicated. Changes and concessions will have to be made — or perhaps the people of those countries will rise up, too. 4 is the number of WORK and WORKERS. 8 is the number of BUSINESS and INCORPORATION. 4 is the number of ATTAINMENT THROUGH WORK. 8 is the number of ATTAINMENT THROUGH ENTITLEMENT. The 44th presidency of the United States would have started out with the same 44/8 dynamic no matter who won it, but the way the winner, Obama or McCain, used this energy, would of course be very different. 2011 connects ‘the meeting of opposites’ to the 44th presidency so that healing — or havoc — can occur! This could mean that there will be terrible conflict among people, or it could mean that people in all walks of life will finally realize how futile it is for humanity to be at war with itself, and will start living in a way that reflects that. To the great frustration of many of his supporters, President Obama constantly seeks common ground with those who continue to block every move he makes. His strategy may not bring instant results, but it does bring the stability necessary to change things for the long term. Is he really just ‘placating’ the bankers and CEOs, or is he operating from the knowledge that this tiny percentage of humanity has such a tight and ruthless grip on the world economy and many other aspects of life, that a slower and more cautious approach is needed to ensure that their greed — the inability to feel satisfaction — does not cause a complete economic, social and environmental meltdown? The 44th presidency of the United States, by its number alone, has enormous potential for positive change, and has a crucial role to play in the evolution of people. The 44th presidency could redefine the role of government worldwide one way or another. True leadership, in the 2 energy, will create and maintain just the right balance that enables others to lead their own lives and live as they want to live. True leadership must facilitate all walks of life. A tiny percentage of the population have arranged life on Earth in such a way that all abundance flows to them. They demand total accountability from the masses while releasing themselves of all accountability. How can that not be a preposterous and dangerous situation? The very same people who helped create the problems are still running the show, but not nearly as easily as they once could. They are still in deep denial, but are starting to sense the gnashing of fear close by. When they realize how isolated they have made themselves and that those beneath them are no longer willing to support their weight, fear will set in and may make them even more irresponsible than they already are, and we must be prepared for that. The ‘old boy network’ is fighting to keep itself together, but is so out of focus when it comes to what it’s really dealing with — the rise of the human WILL — that it gets caught off-guard quite frequently. There is nothing wrong with wealth. This is an abundant world. But when greed becomes so rampant that the rich resort to stealing from the poor, there is definitely something wrong, not only from an ethical point of view, but also from the standpoint of survival. The imbalance created when all the abundance is concentrated in one spot turns our economic system into a house with no walls, only a roof, which is falling as we speak. And all they have to do to stop it is let the wealth flow downwards! They cannot do that because they deny the fact that it is the people underneath who sustain economies by SPENDING. Without a buoyant economy, there is nothing to keep those at the top afloat. We are likely to see some bankers, executives and other power seekers jumping ship this year, or suddenly shifting their policies to accommodate ‘the people’. Perhaps fear will enable them to face their reality and finally break free of the grip that greed has on them. Or, perhaps their actions will finally be acknowledged, formally, as the CRIMES against humanity that they are. We still don’t appreciate the massive divide that exists between masculine and feminine. There is a serious misunderstanding in which feminine energy — emotion — is largely regarded as ‘negative’ and therefore something to ‘get rid of’. But we cannot have unconditional love if there are parts of ourselves that we do not love. Feminine energy is the Will which is now struggling to free itself all over the world. The feminine energy — the HONESTY — in all human beings is rising to the surface so that it can finally do what it needs to do to survive. HONESTY NEEDS TO EXPRESS ITSELF. We need to meet our emotions with LOVE, not disgust and judgment. Love doesn’t throw anger out or wrap it in guilt. Love LOVES anger, and is therefore able to soothe and heal it, allowing it to return to the love it once was. People are feeling the pain that comes from being controlled by others, especially those who are unqualified to hold positions of authority. Our pain is expressed as anger, which is a healthy and natural response. But when anger is denied or ignored, it builds and intensifies until it morphs into RAGE — the color red — the color that runs through our veins. The first and most basic chakra. SURVIVAL! Change takes place from the inside out, and when we can be completely honest with ourselves as to what we are feeling inside, the imagination opens to reveal solutions. Before we can understand the 4 energy, we need to better understand the 3 energy that we past through in 2010. When triangular energy works as it is meant to, it gives life CONTINUITY. 3 = the continuance of life, just as 1 = father, 2 = mother and 3 = child. Life goes on. 369 involves stress, opposing extremes, and the balance points between. Think of a triangle with hinges. If you let its 3 sides move freely, they will fall and form another triangle, and then another and another — UNLESS the sides of the triangle are uneven or bent. When the integrity of those three lines are compromised, balance and stability are lost. Everything grinds to a halt and we become ‘boxed in’ and stagnant. 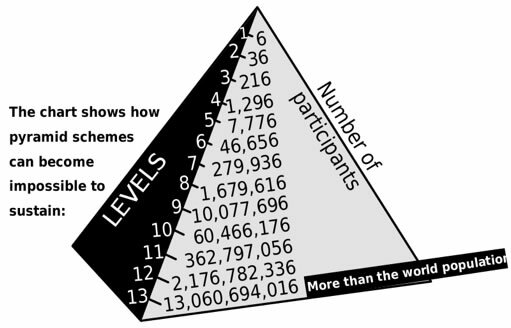 Graphic courtesy of Wikipedia- Pyramid Shceme. 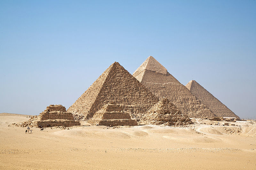 It seems fitting that the gigantic pyramid scheme that we call ‘the system’ is starting to reverse itself in Egypt of all places, the land of pyramids, and that pyramids are comprised of both triangles and squares. On 10 February, 2011, the 17th day of the Protests in Tahrir Square, came the announcement that Egypt’s dictator Hosni Mubarak would be stepping down (both Mubarak and Omar Suleiman are in the 4 personal year, by the way). The crowds and the world — were elated. But then came the speech that was designed to shock, devastate and intimidate, in which he said he would not step down. How amazing that the people did not fall into his trap and start rioting. The 17th day is significant: 1+7=8 ~ the number of POWER ON THE MATERIAL PLANE. It was a setback. The people held themselves together. They would prevail. At that point, Mubarak must have known that he did not stand a chance. His fear tactics had failed completely. The 10th is significant here because it represents taking the steps that bring a situation to the NEXT LEVEL with the advantage of accumulated experience. Evolution itself. February, the second month, brought in the 2 energy which is about “I AM” becoming “WE ARE”, as and when needed. Also on 10 February, 2011, came the announcement that was totally over-shadowed by the events in Egypt of a merger between the New York Stock Exchange and Germany’s Deutsche Boerse exchange. The contest to BE #1 by those at the top of the pyramid has intensified significantly. Life at the top is getting very narrow, very shallow indeed. But because they are oblivious to what’s happening ‘beneath’ them, they could come seriously ‘unhinged’ this year to the extent that accountability is finally forced on them. And the judgments are likely to be very harsh as we continue to learn the details of the huge deceit and trickery foisted upon the population. Instead of saying, “oh well, that’s just the way the system works”, people are realizing that great crimes have been committed against humanity by the power-hungry few, for the purpose of acquisition, positioning and insatiable greed. As we move closer to free will each year and each day, the more outraged we become. Global economics have reached a point at which all the wealth of this abundant Earth has been siphoned to the top of a system of ‘pyramid’ or ‘ponzi’ tactics — a game — a swindle which lures investors to take bigger and bigger risks by giving them a quick return on their initial investment. It’s organized theft. Organized crime. The industrial system is now so top heavy, with virtually nothing ‘trickling down’ that it is nothing but a burden on the rest of humanity and the planet itself. The 1% at the top of the pyramid leans heavily on the rest of us for support. In the 4 global year, which focuses on WORK and HOW THINGS WORK, it will become undeniable that this economic system simply does not work! Either governments begin the process of carefully reversing out of this mess or the whole pyramid collapses — with grave global consequences. We must get very serious about how we are going to care for ourselves and each other as the world takes a number of chaotic swings this year. We must remember too that the PLANET is also taking measures to protect, balance, heal and free herself. 4 vibrates as the color green, and environmental matters, including the wellbeing of animals, are becoming more urgent every day. Meanwhile, we remain afraid of things which, by now, we ought to have experience of. But we don’t. We are so locked into old programming — so saturated by old erroneous beliefs and attitudes, so entrenched in “life as we know it”, so numb to our own feelings and senses, that we cannot imagine a different way to live, even though we know we must live differently if we are to survive. 4 is also symbolized by THE BOX. Feelings of being ‘boxed in’ are common in the 4 energy. 4 also shows us how dependent we are on various factors and how we cannot take anything for granted as our evolutionary journey proceeds. Suddenly people all over the world realize just how fragile the internet is and that like most other mechanisms in our world, it can be taken down with the flick of a switch…. And then what will we do? This is why the ‘net neutrality act’ in the United States is such an important aspect of our lives. The control of communication has been one of the major problems in the world all along. The internet is a vivid reflection of the WILL OF THE PEOPLE. Once openness among people prevails, we won’t need the internet, but until that far-off day arrives, we must certainly do what we can to protect it AND protect ourselves from it!!! The computer is as much a BOX as is the TV and the phone! All of our ‘boxed technology’ — our devices — are addictive, distracting and time consuming. In fact, one of the greatest feelings of being ‘boxed in’ occurs when we realize just how glued to these things we have become. We must find our balance and, as we do, we are likely to become far more interested in how technology can be used to help ourselves and each other. We need to look at life through wiser eyes now. The 4 global year can make us feel that we are stuck between a rock and a hard place — damned if we do and damned if we don’t — but that is only because we are trying to apply the same old solutions to the same old problems. We cannot ‘think outside the box’ unless we create an opening in the box first. And when we do, we find that we are in another box, and another, and yet another. This is not new. It has always been that way — there is always something standing between us and what we want. The practical 4 energy helps us understand that what we want to achieve in outer reality must be achieved within first. This is the last year that 11 is going to dominate the numerological spectrum for some time to come. 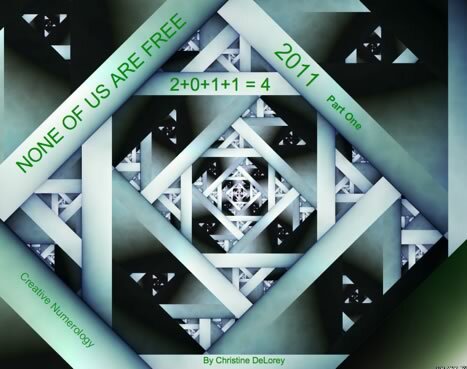 1+1=2, and it seems that from 2012 onward, we will be learning more about 2, which is the sum of 11. 2 is the most prominent number of the new millennium, the 2000s. 2 is the number of the feminine, partnership, equality, peace, balance, intuition, sensitivity, connections between past, present and future and, above all, PATIENCE. Of course, 1 is the number that makes all the other numbers possible! 1 is the number of self- understanding, self-acceptance, and self-love. But until we manifest these essential qualities in our lives, all we will get is selfishness and the inability to care about others. 11 reflects this acceptance. We cannot reach 2 without adding 1 and 1 together. Throughout the year, and reaching some kind of climax in November, the emphasis on 11 will — and must — reach a crescendo of some kind, because the gateways into expanded consciousness that 11 provides are going to become less available after that. 11 is the number of illumination — the bringer of truth — the key to openness and free will. 11 leads to 2. Two 2s produce the master energy associated with 4. When 22 is infused with love, it enables the improvement of conditions for the masses to the extent that evolvement occurs on a grand and accelerated level. 22 is the number of the master builder and activator of grand-scale plans. When love is not the motivating factor of 22, the result is chaos and stagnation. The karmic element of 13 is also involved this year which forces us to see the shallowness of our endeavors and activities, and how our idea of ‘accomplishment’ is limited and mundane. It forces us to recognize the fact that we are not using the gifts we have been given in a way that could improve life on Earth. 13 forces us to see how we squander our time and resources instead of using them to help ourselves get out of our various ‘messes’. And then we complain about not having enough time or resources. There is far too much superstition about this number. 13 represents evolution and change by learning new truths which enable BREAKTHROUGH. The belief systems of millions of people all over the world are at a serious turning point. Deep feelings are stirring. We are moving forward. Even when we are stuck, we are building momentum within which will result breakthroughs of consciousness followed by breakthroughs in the outer world. However, we may often find ourselves in emotional mazes this year, designed to prevent further movement toward freedom. 13 will help us learn to deal with our many limitations, and develop a new way of thinking which leads to INNOVATION. It is therefore essential that we keep our minds open to the unusual and not be ruled by logic alone. It is also essential that we are willing to dig deep for understanding, and are patient for results. When 13 karmic energy is ignored, we become lazy, complacent, indifferent, judgmental, selfish and disorganized, especially when it comes to changing our minds. Ignored 13 energy produces ignorance. Ignored 13 energy leaves us having to work extremely hard for what we want. It leaves us with strong feelings of dissatisfaction and despair. When we do not care about the plight of others, our own ‘plights’ become ignored too, and there seems to be no way out. Ignored 13 produces people who lack honesty, integrity or the commonsense to put the necessary effort into gaining stability. That very feeling of having ‘no way out’ is likely to be felt strongly this year for the purpose of pushing us into making the essential moves we have been too afraid to make. I mentioned the numbers 10 10 10 at the beginning of this article for a good reason. This sequence may not be a palindrome, but it is a distinct numerical pattern. 10 is the energy that brings things to the next level. The number of real CHANGE! 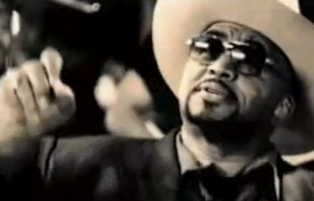 On 10 10 10 (October 10, 2010) American singer Solomon Burke passed away. His passing left a deeply moving and VITAL message for the world. Here it is. Fascinating insights, as always. I think I’ll need several more passes before I’ve groked everything. Thank you Christine! Thank you, this is amazing. Very much looking forward to Part Two. Wonderful article – very inspiring! It seems to me that the energy and qualities of the number 4 relate much more to the root chakra than the heart chakra – the numbers given to the chakras being less important than the names and locations of them. A small correction, the French word for heart is “coeur” – bonne continuation! Very well written and inspiring. I enjoyed every word and number! BRAVO! Thank you for sharing! All comments are moderated. No additional signup is required to comment. Copyright © 2011 by Planet Waves, Inc. All Rights Reserved.